For the past 431 years, devotees have celebrated the “Dark Virgin of the Lake” alongside the shores of Lake Titicaca. 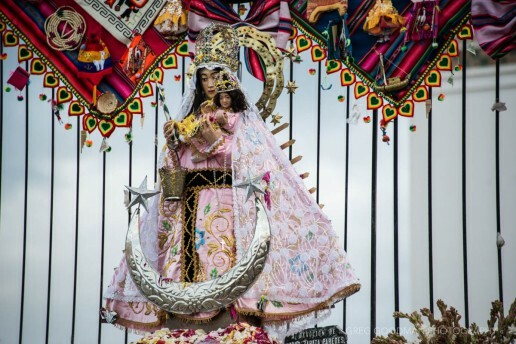 Each year, Puno, Peru, and Copacabana, Bolivia, host one of South America’s largest festivals: the Festividad en Honor a la Virgen de la Candelaria. This epic fiesta features parades, tradition, culture, music, rituals, dancing, prayer, ceremonies, booze … and some of the most ornate costumes in the world. The festival has two main phases. The first occurs on February 2, and involves a procession carrying the statue of the Virgin around the city while dancers in lavish costumes join the parade. The dancers, who come from communities near and far, pause in front of the town cathedral to be blessed with holy water. After settling into our hotel, my wife, Carrie, and I ventured out and joined the crowd. By then, the parades had ended and the well-dressed locals were busy getting completely drunk. I don’t think I’ve ever seen so many beer bottles stacked in one place. It didn’t take long before a group of friendly Peruvians invited us to join them in dancing and drinking. Carrie and I politely declined their libations, but had a blast holding hands in a circle and swaying around to the music coming from a nearby stage. Sadly, the fun-filled experience ended in theft. On the way back to our guesthouse, Carrie and I found ourselves in a particularly crowded corner. Drunken people were jostling and falling over each other, and one such man found his way up against me. At that point, there was nothing left to do except go back to our holiday rental and see if he stole anything else. Fortunately, all the thief got was my new point and shoot camera … not my Nikon D800. Still, this was the first time in my life that something had been something stolen off my person …and hopefully the last. As thousands of people filled the town, we watched the sleepy hamlet transform itself into a bustling party-central. locals came dressed in their Sunday best. crates of beer lined the walkways. 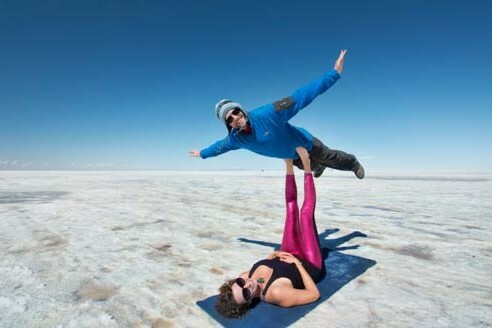 Carrie and I followed the festival across the international lines — via a harrowing experience at the Bolivian border — and checked into Hotel la Cúpula: a beautiful holiday rental in Copacabana, Bolivia. As backpackers, it’s not often that we treat ourselves to a luxury holiday rental. When we do, we usually research it online first using site like HouseTrip. This time, we just showed up and hoped for the best. After arriving at la Cúpula, we knew that this was one of those special times. For $50/night, our suite featured a king bed, hot tub, kitchenette, fireplace, couch and wall-to-wall windows overlooking Lake Titicaca. For nearly a fortnight, we relaxed, roamed the streets, ate delicious food, participated in the celebration and enjoyed a vacation from our holiday. I probably spent more time at this parade that I have at any other parade in my life. For nearly 5 hours, Carrie and I watched a procession of traditional dance, provincial marching bands and a collection of costumes that rivals that of Carnival. These ornate outfits aren’t light either; each one weighs roughly 40 pounds. Try dancing through the streets for hours in that. What is your favorite celebration in the world?